THE KLEZMORIM > Bongo > Left Coast Origins > Eureka! Many of the musics I liked best shared a common stylistic influence. The missing link must be Yiddish, because Yiddish was the common denominator between Russia, New York, the radical European stage, early film soundtracks, and jazz. Whatever this unknown genre was, nobody seemed to be playing or recording it any more. If this sounds a bit like Sherlock Holmes crying, "Aha! The fatal dose of poison was administered by a left-handed ape disguised as an Albanian unicyclist!" ...What can I tell ya? I sussed the evidence and tracked the beast. Hypothesizing klezmer music's existence wasn't enough, however — I needed hard evidence in the form of old-time recordings. For the next several years I chased wild geese as helpful music lovers steered me completely wrong. Klezmer was absolutely off everybody's radar screen: beneath notice, remote, scary, a skeleton in the collective closet. 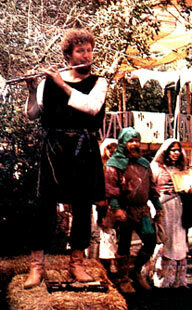 In 1974, while busking as a medieval/Balkan flutist at the Northern California Renaissance Faire, I attended a bacchanalian midnight after-party where Patty Farber performed her notorious Goat Dance, the single most salacious tail-twitch in the history of the world. Then Pitu Guli — a Bulgarian-themed UCLA Balkan supergroup featuring Stu Brotman, Stewart Mennin, Miamon Miller, David Shochat, and Ed Leddel — played Yiddish and Serbian tunes on sax, clarinet, trumpet, tuba, drums... and I was utterly enchanted as the music I'd been trying to wrap my brain around since 1971 seemed to emerge from the murk... a hidden treasure that, maybe, had been in my back yard the whole time.